It's the week of love. I know people have all sorts of feelings about Valentine's Day. But I've decided this year to just embrace it. I mean, what's so bad about encouraging others to love on their people? I may have even ordered my kids a little gift. Shhh. Don't tell them. I personally love Valentine's Day because it's the anniversary of my first date with my husband ... before he was my husband ... 17 years ago. My, how time flies. We've since dubbed Feb. 14 "First-Date Day" and would celebrate even if the rest of the world wasn't. You people are my friends. We may not get to lunch together or show up with dinner when it's been a hard day. But we can love on each other anyway. That's the beauty of technology. So I raided my gift closet and pulled out some of my favorite things to give you! John 14:27 Print from HopeInk.com & a PDF copy of "Peace in the Process" :: It's one of my favorite scriptures and there are butterflies on the 8x10 print. Butterflies remind me of when I decided to follow Jesus at a weekend that was built on the metaphor of transforming from caterpillars into butterflies. "Let Heaven and Nature Sing" & Loved plaque :: "Joy to the World" is one of my favorite songs and the one that spoke so deeply into my life about #choosingJOY this year. The plaque quotes Holley Gerth, a favorite author of mine who encourages and loves so well. Both come from DaySpring.com, which is a great place to shop. "Sing the Bible" by Slugs & Bugs :: This may be "kids' music," but I love it. Package of 12 Sharpies & PDF copy of "Peace in the Process" :: Um, who doesn't love Sharpies? Romans 8:28 plaque :: This is one of my two all-time favorite verses. Use the Rafflecopter widget below to enter to win. The giveaway will be open through the weekend and then I'll announce the winners, which will be chosen randomly, on Monday. Speaking of giveaways, did you see my daughter's first-ever book review? And we're giving away the book she loved. I'm linking this post with the Soli Deo Gloria Sisterhood Gathering, one of my favorite places on the internet. So my overall feelings on Vday is that I love it, but my involvement in it seems to vary from year to year. I remember a special teacher in high school always made such a big deal out of it. It was her way of showing Christ's love as best she could in a public school. I should be better at doing the same for my children. That's such a great perspective, Teaque. Now, the only real question is ... will you start blogging again?! Pretty please?! Yes - celebrate with the people you love in the ways you want! That's what I want to do. The less pressure the better, hence the store-bought valentines my kids have filled out for their school friends. :) Hopefully you'll get a date soon, Tabitha! I love Valentines. It's a day to make others feel special! I like the way you think, Melanie! I love your giving spirit! You are such a blessing to SO many. I'm glad to be included in those who get to know you! Happy Anniversary! 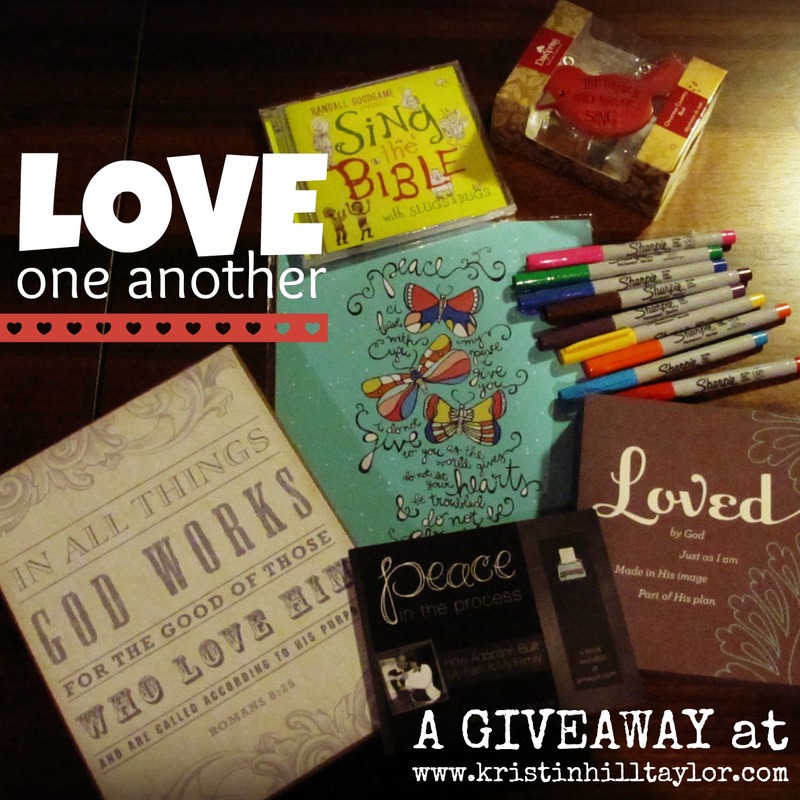 what a fun give away... you are a generous heart! Thanks, Dawn! I'm glad you joined in the fun!